I teach rock, classical, music theory, music reading and ear training on electric and acoustic guitars. When you understand music at a fundamental level you can learn any style any level. Communicating like a musician is key... have fun, never stop learning. Group Lessons Instructor with the Northeast Independent School District at Ronald Reagan High School, Churchill High School, and Stone Oak Elementary, and other schools in the school district. Director, producer, camp counselor and guitar instructor with multiple nationwide music camps in Dallas Texas, San Diego California, and Boulder Colorado. I have been teaching guitar for about 17 years and playing music for about 30 years. I studied music and guitar at San Antonio College. 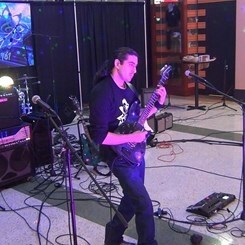 Former Guitar Instructor and Guitar Salesperson for Hermes Music, Mars Music and other Music Stores in San Antonio. My students perform with the San Antonio Spurs organization, playing the National Anthem, half-time shows, and pre-game and post-game performances at the AT&T Center. Now available for guitar lessons at Music & Arts Stone Oak Location on Tuesdays. Call the store now to book an appointment or schedule a guitar lesson! Request Lessons with GIOVANNI today!